When shooting your 1911, SIG P220, Glock 21, or other .45 ACP handgun at an indoor range, give this clean-firing ammunition from Federal's American Eagle series a try. 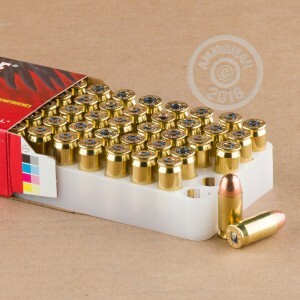 These cartridges use total metal jacket bullets and non-toxic primers to keep lead and other heavy metals from entering the air where they may be inhaled. 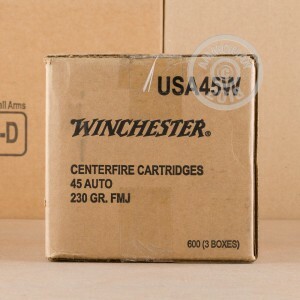 Each cartridge in this box of 50 fires a 230 grain total metal jacket bullet at 850 feet per second. TMJ bullets provide full encapsulation of the lead core and are safer to shoot in enclosed spaces. 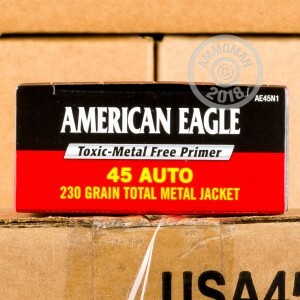 This ammo is made at Federal's headquarters in Anoka, Minnesota and uses non-corrosive, heavy metal free primers and reloadable brass cases.